IPL hair removal is more common than ever before, prices are dropping and more people are getting their hands on this technology. There are more and more “home IPL devices” on the market than ever before. But just like anything they are not all created the same. 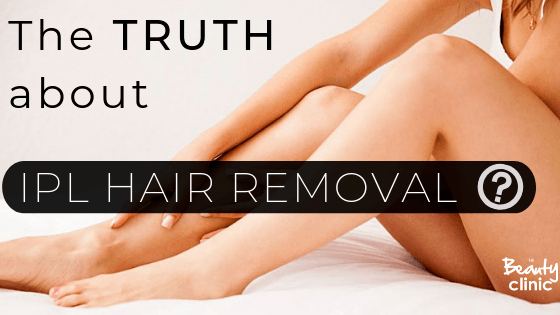 Today we share the honest TRUTH around IPL hair removal. We have all heard stories of a friend of a friend who spent hundreds of dollars on IPL hair removal and ended up with zero results. But what we need to remember is there are many factors that make up a successful IPL treatment. Most of these factors come from your own body, such as hormones, medications, medical conditions and colour of the hairs. Other causes could be due to the person delivering the treatment, was the correct treatment procedure followed, correct technique used and timing of the appointments. Are they even trained in IPL hair removal at all? Finally, the quality and maintenance of the IPL equipment. Choosing an accredited clinic to carry out your treatment is vital to your results. We cannot promise 100% permanent hair removal. We can also only treat active hairs (in the ‘anagen’ cycle). So after a course of IPL hair removal, we will have destroyed the suitable treated follicle’s and they will never grow back, but there is a strong possibility that a brand new follicle may activate or follicles, not in the ‘anagen’ phase will still grow. Most certified IPL providers are aiming to provide an 80% hair reduction in the hairs present at the start of treatment. The number one factor that may trigger new hair growth is hormones. It could be hormones due to pregnancy, menopause or a hormonal condition. We must make clients aware that this is a possibility after their treatment, as no hair removal can be classed as ‘permanent’. IPL is semi-permanent and does need maintenance. Maintenance could be a yearly treatment or even 3-5years down the track, depending on the individual. IPL hair removal is only suitable for dark hair as the light is attracted to the melanin (colour) in the hair. Many people with light, white or red hair would not benefit from IPL as there is no melanin in the hair, UNTIL NOW. As technology has advanced we can now treat white, blonde & red hairs with the only IPL machine in the world The Efb Beauté Adéna – available at The Beauty Clinic- Botany & Meadowbank. With advanced technology and a different process, we can treat blonde, white and red hair with fantastic results- you fair beauty’s no longer need to miss out! Read more on White Hair Removal here. As darker skin has a higher melanin level, some IPL machines are just not able to safely treat. IPL works by finding the melanin in a hair and if the skin has a high level of melanin present, the machine simply cannot tell the difference! What happens is the pulse of light just spreads over the closest melanin it can find, the surface of the skin, which can result in painful burns or blisters. Even if this doesn’t happen, the light is absorbed by the melanin in the skin before it can reach the follicle- hence why there is NO result! Some treatment providers simply reduce the heat of their IPL machines to prevent damage to the skin, but this prevents any result at all. The Efb Beauté Adéna IPL is able to treat darker skins than most machines, please book for a consultation to see if you are suitable. – available at The Beauty Clinic- Botany & Meadowbank. Have you ever added up the cost of your monthly waxing or shaving, you may be surprised that in the long run you will SAVE money investing in IPL Hair removal with the added bonus of getting rid of the painful monthly wax or annoying prickly legs! At The Beauty Clinic we offer payment options as well as our Beauty Plan programme which gives you the option of paying off your treatment weekly, fortnightly or monthly with no interest and the added extras our Beauty Plan members receive. Book yourself in for a complimentary consultation. We sit with you and discuss all your questions and concerns – The Beauty Clinic believes you should have the opportunity to gain professional advice before making your decision. Our consultations are not only complimentary, but you are under no obligation to undergo treatment with us.